I have plenty of pellets, but I have lately been getting inquiries about them that surprise me. Someone referred a young NC shooter last month who wanted to buy a field target gun. I had a backup rifle, and offered him this tuned Marauder setup, so he immediately came to get it. I gave him a tin of my favorite JSB Exact Heavy, 10.34 grain in 4.52 (confirmed by sampling). Told him that's what I shot, and the gun was set up for 20 FPE with this weight. I have checked a lot of pellets, and my experience is that if I have consistent sized pellets in the range 4.51-4,53, they are fine. We shot a few pellets at 30 yards, grouped fine, and he left happy. Later, I heard from him that he had ordered four new tins of pellets as I had suggested, and that they were almost all undersized. He said at below 4.51, he had terrible groups. Strange, I thought (and still do). 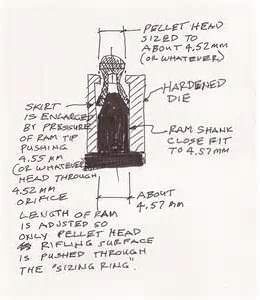 In wide discussions about pellet sizes, I have the firm concept that most barrels are designed to shoot 4.52 mm pellets. Some are very picky about that, others are not. "Pickiness" means that the gun will be optimal at about +/- 0.01 mm from the best size. Some barrels can do fine with a wider range. Some do best with pellets a little below or above that size.So, I also believe that if you have a barrel that does best with say, 4.51 and it will do fine with 4.50-4.52, you may buy pellets that are nominally 4.52, but the tin has mean size of 4.53 with some 4.54's. Now, you shoot those, and say, "This gun does not 'like' brand X" What you really need are some pellets that are 4-50-4.52. It's getting harder to be sure of getting that. And I am completely leaving out the possibility that your nominal 4.52 pellet tin has a wide range of sizes, 4.49 up to 4.54. I think some of those may be wild flyers, but it could be that the gun could give you good groups with pellets that are consistently 4.51, and good groups with 4.53 – but shooting them mixed produces a combination of two "groups" that look like one bad group. That's my observation, anyway, and others have told me that they have seen this. 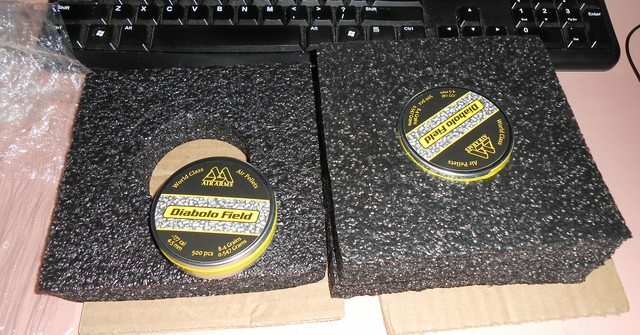 So I have just received an order with three tins of pellets, JSB Heavy 4.52, AA Diabolo Field Heavy 10.3 gr 4.52, and H&N Baracuda Match 10.65 gr 4.52 mm. These all came in the same box from my favorite pellet supplier. The AA and H&N Pellets are labelled as 4.52. The JSB are not specifically labelled. My intent here is to see whether I would get the size I really wanted. I have begun some sorting, and will report results in posts on this thread. And I am completely leaving out the possibility that your nominal 4.52 pellet tin has a wide range of sizes, 4.49 up to 4.54. I think some of those may be wild flyers, but it could be that the gun could give you good groups with pellets that are consistently 4.51, and good groups with 4.53 - but shooting them mixed produces a combination of two "groups" that look like one bad group. That's my observation, anyway, and others have told me that they have seen this. First up, the JSB. I have probably shot 15-20 tins of this pellet, and don't recall any that were really "bad". I used my PelletgageR first. My idea was to use this experiment to confirm that a PelletgageR would give me measurement results similar to the normal Pelletgage. I took a sample of 48 pellets from the fresh tin. The PelletgageR was set up with 4.53 upper gage plate, and 4.51 lower gage plate. If the pellets drop through the upper gage, they are under 4.53. and if they catch in the lower gage plate, they are above 4.51. This is what I wanted to see. If they drop through the lower gage plate and catch on the skirt, head size is <4.51. No pellets >4.53. Just ONE pellet in the desired >4.51<4.53 range (whoa!). 47 pellets under 4.51. Not what I wanted. I must brag, this took maybe 3 minutes. Should have timed it. I do intend to produce a video to show how this works – it is fast. I believe that if I had the majority of the pellets dropping in the position with the line (above), all would be well. So, the mean size of the pellets in the sample is 4.50 mm and 95% of the pellets in that tin (+/- 2 sigma) are 4.493 to 4.515 mm. The results correlate well with those from the PelletgageR, too (yay). Weight variance seemed pretty good. 95% can be expected to be between 10.5 and 10.2 grains. This is a very consistent range, in my experience, but it runs too small. See the histogram below. Note, all the pellets in the sample are <4.51 and the mean is shifted 0.02 mm from nominal. It demonstrates to me that JSB has process control, although they are not taking action to correct a shift. The red peak ought to be on the 4.52 column. I suggest a histogram is the most obvious way to illustrate the issue. From my admittedly simplistic view of statistical quality control, these pellets are a reject. My premise is that if the mean was within 0.01 of the nominal (that is, if the pellets sold as 4.52 mm had an average of 4.51) and if the deviation was in the range +/- 0.01 (which notably, this tin DOES meet), that is a "pass". I will work on the other two tins and post results by tomorrow, I have dinner plans tonight. I must brag, this took maybe 3 minutes. Should have timed it. I do intend to produce a video to show how this works - it is fast. I believe that if I had the majority of the pellets dropping in the position with the line (above), all would be well. Very interesting information. Thank you for the effort. Some have suggested that any size that isn't too small will work fine because they will be "sized" by the barrel. I agree with what I believe you are saying, that noticeably too large can be just as bad for accuracy as is too small. Correct me if I am wrong in assuming this is what you are saying. This reply was modified 2 months ago by bandg. My daystate likes 4.52s aa well. Jsb 10.34s , I use your gauge and most Jsbs are good. I ordered another brand of pellets with 4.50 stamped on the tin. They are actually 4.55, my barrel doesn't like them at all. I also noticed that MANY of the pellet heads were actually OVAL by as much as .02mm so it seems to me that sorting pellets using "holes in a plate" will only sort the pellets by the largest diameter of the "oval". 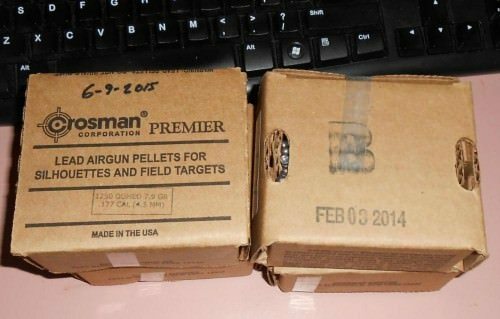 The H&N FTTs that were supposedly 4.50 & 4.52mm weren't much different when it came to consistency and "ovality"………..
My solution was to use 7.9 grain Crosman Premiers from the die lot marked boxes that I've used for years and simply resize the pellet heads to a consistent size since the CPL heads are rather consistent, however run large at about 4.53mm -4.55mm………….. I madea couple different pellet head sizers but found that pellets my 4.50mm sizer (made from lapping the 4.48mm die to 4.50mm) worked equally well in my tight leade .177 HW95 AND my older .177 Beeman R9 which has a looser leade………. 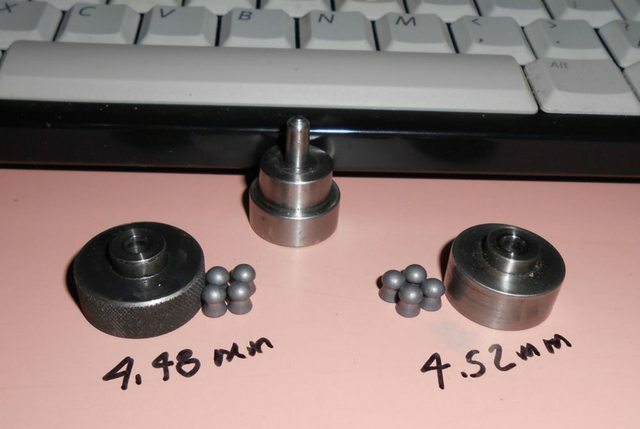 I recently received an order for four tins of 4.52mm 8.4 grain Air Arms Domes and found that the head sizes were considerably more consistent than the JSB Exacts with most AA domes having 4.51mm heads. This gave me the idea of using my 4.50mm pellet head sizer to make the AA heads consistent. Almost ALL AA pellet heads from the tins labeled 4.52mm were sized about .01mm and very consistent so I did a bit of casual grouping upstairs at 18 yards resting the tighter leade HW95 on cross sticks while sitting on my "hunter class field target bucket". Here was the result……….. Both groups were similar, however the "sized pellet" group was a tad smaller. 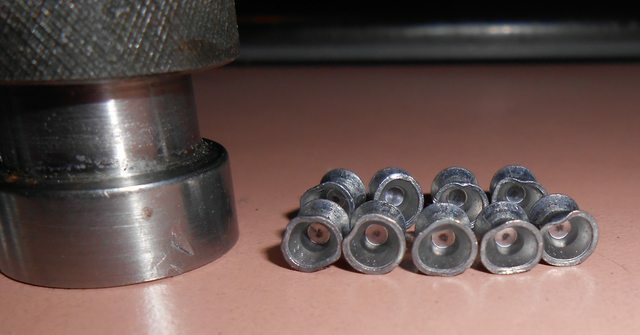 Since I was shooting HFT style I can't declare that the tighter group was due to pellet head sizing, however it certainly wasn't worse so I went ahead and sized all the AA domes I had to 4.50mm………. 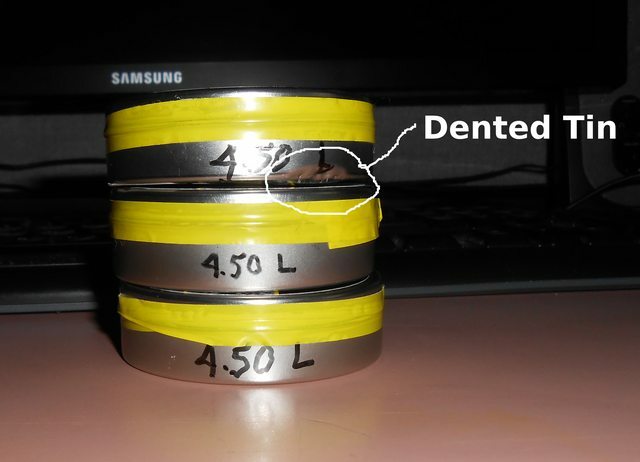 As a side note, one of the tins I received with the order was dented like this………. 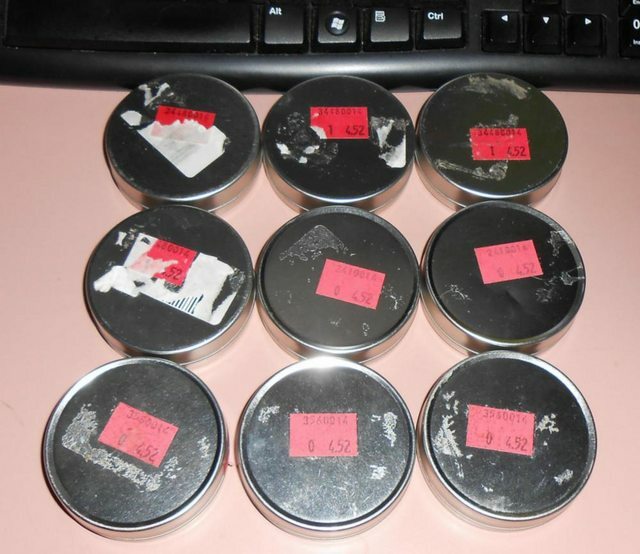 Here are the pellets from the above dented tin that had deformed skirts so they weren't head sized………. Since the pellets came from Pyramyd Air and packed like this, I'm pretty sure that the tin wasn't damaged in shipping……. Pelletgage, I am very happy to see that I am not the only one that has found the 10.34's to be NOT and FAR FROM what is marked on the tins!! 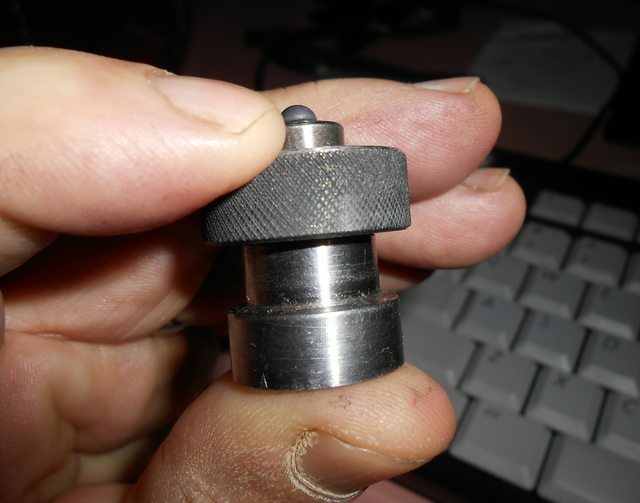 I have started many threads on the various boards about this very thing sense I began head sizing and weighing pellets well over a year ago with your gage. I reported that I had purchased over 20,000 JSB 10.34 pellets from various vendors around the country trying to find a batch that actually had 4.52 head size pellets in the tins that were marked as such with pretty much no success , as out of that twenty thousand I found less than 400 that were actually 4.52 with the vast majority being 4.50 and 4.49!! I finally gave up trying to find them and discovered that the new redesigned Monster 13.34 pellets were as marked on the tins and were VERY consistent with only a few (between 10 and 20 per tin ) being 4.51 and the rest being as marked at 4.52. I would much rather be shooting the lighter 10.34's as I shoot Field target but both of my Air Arms rifles will only shoot the larger head size with consistency and almost all of the unexplained shots (flyers) as they are called have been eliminated by head sizing. I once even reported this to a JSB representative whom seemed very surprised and concerned by my findings and promised to " look into it" but I never heard anything back from him!! Didn't really think I would!! I don't know if there dies are worn out or if they just have a Quality control issue but I know they may as well not label them as a certain head size as what's on the tins sure AIN'T whats in the tins!! Good luck with you research !! I'm looking forward to the rest of your findings!! So does the pelletgage-r come with both sizing plates? Hello, Chacoze, the PelletgageR is sold individually, each with complete set of plastic and hardware. I do recommend getting two (a "go" and a "no-go") and they can be assembled in a stacked arrangement if they are carefully assembled. It is presently available in 4.50, 4.51, 4.52, 4.53, and 4.54 mm sizes. I suggest that once you know the diameter(s) that work in your gun, you may want to order a 4.50/4.52 combination for instance – to sort out pellets >4.52 and <4.50 mm. I suggest that once you know the diameter(s) that work in your gun, you may want to order a 4.50/4.52 combination for instance - to sort out pellets >4.52 and <4.50 mm. I can only commiserate. When I asked about the preferred head sizes of .177 on this board, there were responses saying that shooters had guns that shot best <4.51 and another who wanted >4.53. That's a difficult issue, as it seems that pellets are often NOT the nominal sized indicated, in any case. 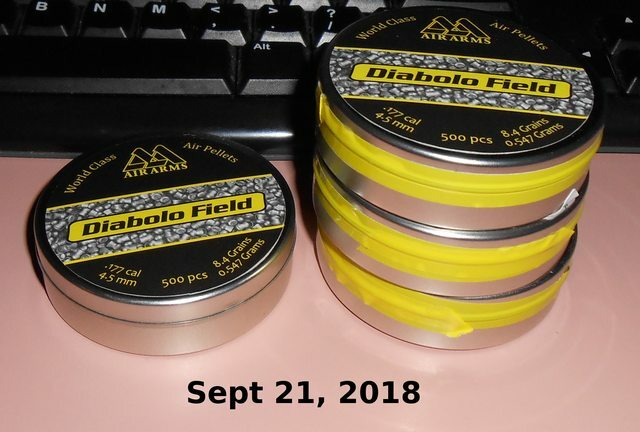 I just finished gaging and tabulating results on a new tin of AA Diabolo Field Heavy 10.3 grain in 4.52. They are almost identical to the JSB 10.34's in this thread. Maybe the H&N are closer to 4.52. Ed, I have used the Yrrah method of rolling pellets to determine any degree of "out of roundness", and don't find what you do – name brand pellets seem to be truly round in the great majority of cases. You have several times called Pelletgage "holes in a plate", but the gage results are far more repeatable than what can be done with calipers. First, calipers are rated for +/- 0.001 inch (0.025 mm) tolerance, and the position of the item being measured in the jaws is critical, as the jaws themselves are not perfectly parallel. I guarantee that the apertures in the Pelletgage and PelletgageR are within 0.0025 mm (0.0001 inch) of the nominal indicated size. These are some pretty accurate holes, and there are no moving parts, no indicator dial or magnetic strip/readout involved. Now, maybe you have a superior set of calipers (I'd suggest a micrometer is better), but you are still measuring between two points on a three dimensional spheroidal surface. The number of such positions to measure is almost infinite. Picking up the same pellet and re-measuring and getting a different measurement may be due to the pellet being out of round, but is far more likely to be simply measurement error or measurement of a different chord. If you get off axis, you may not be measuring the real OD. Using geometry, the size of a "ding" on a perfect circle that would reduce the radius by 0.01 mm is six degrees. Look at the face of a watch, that's would be a flat spot across one minute on the face. If you position your jaws within the flat spot, you would measure 0.01 mm less with a perfect instrument. And if you repositioned the jaws on the protrusion next to the flat spot, you'd see about 0.01 mm longer diameter. While it is true that the Pelletgage would reject an oval pellet based on the diameter of major axis, it's not as significant a drawback as the errors possible when using just two points on the spheroidal object, and that's ignoring the possibility of instrument inaccuracy. Pelletgage gives repeatable results. Your results are very likely to have some significance, but I cannot see how anyone discards the simplicity and traceable precision of the Pelletgage. Now, I think possibly some folks reading this thread may have a source of sorted pellets, Ed! You have certainly put a lot of effort into this, and I appreciate your interest, your nice photos, and comments. This reply was modified 2 months ago by Pelletgage. Ed, I have used the Yrrah method of rolling pellets to determine any degree of "out of roundness", and don't find what you do - name brand pellets seem to be truly round in the great majority of cases. Using the 4.53/4.51 PelletgageR, the AA pellets look to be a bit larger head size. I timed myself, this took about 80 seconds! Statistically, this shows good control! I'd say these are almost identical to the JSB pellet tin in both head diameter and weight. The size shows a tight distribution, but they are a little more than 0.01 below nominal 4.52 size. I think they would be fine in my rifle. Those of you who want the "real thing" might not be pleased. They are closer to nominal size, although they have broader deviation. There was one pellet that had a severe weight deviation, and one pellet more than .02 mm from the mean head size. I still consider this to be a pretty good result for all but competition shooting. Here's what they looked like in the PelletgageR. I got this result. As for finding some 4.52 mm pellets, it looked much better. I believe that two pellets in the sample of 48 would be likely fliers. One had a head size of 4.49, and another weighed only 10.22 grains. I have 2 pelletgage's and 1 "R". The R is really nice. Not to say the others aren't but the R saves so much time and trouble. Bring on the video Jerry. This reply was modified 2 months ago by VETTNUT. In addition to the three tins of "heavy" .177 checked last week in the first posts of this thread, I had ordered one new tin of JSB Exact Diabolo 8.44 gn 4.52 mm pellets. 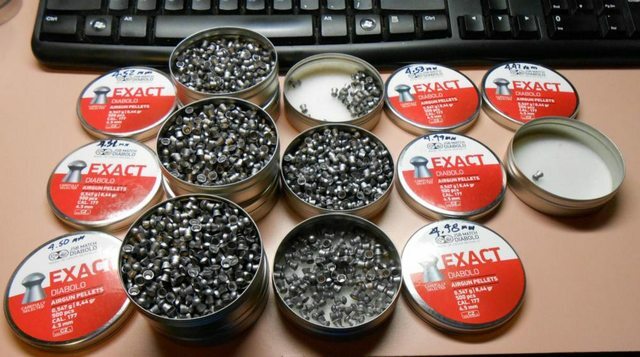 Yesterday I sampled 48 pellets from the 500 pc tin, used the PelletgageR first and got this result. I then weighed and checked each of the same 48 pellets with a regular .177 Pelletgage, getting this result, which correlates very well with the PelletgageR result. My check of these pellets confirms some other assertions that the JSB 4.52 mm headsize pellets can run quite small. This is a shift from the nominal to the mean size of more than 0.02 mm. I say this, considering that in using the Pelletgage, I identify the pellet size as the largest aperture that the pellet will clear, which means that there is a slight bias towards the results being higher than actual diameter. And again, the process control for head size seems OK, with an unexplained bias for nominal size being higher than actual. "I have used the Yrrah method of rolling pellets to determine any degree of "out of roundness", and don't find what you do – name brand pellets seem to be truly round in the great majority of cases." I also used the Yrrah method when I first read about it years ago and found that all the "rolling on an incline" indicated was the relative diameter of the pellet head vs the pellet skirt from pellet to pellet. Didn't have anything to do with a pellet head or skirt being oval by a couple .01 of a mm. "the gage results are far more repeatable than what can be done with calipers"
I would have to agree with you if you're gaging the SAME pellet, however when gaging different pellets with different amounts of ovality the "holes in a plate" are still only sorting by "the fat dimension" of each individual pellet. I do admit that it takes a bit of "technique" and an accurate caliper to measure pellet heads, however I have done this thousands of times and the repeated measurements are consistent enough to verify if a pellet is round or oval. I'm not interested that a pellet head is exactly 4.52mm (or whatever), only that the measurements are consistent whatever the "unit round-off"! The way I've found to get a consistent measurement with digital calipers is to first an accurate caliper and measure a micrometer test bar like this……….. It did take some practice to get a handle on "caliper pressure" but I am able to get consistent readings on my 1" test bar within a "tenth". LOL……certainly accurate enough for my purposes and to know that a pellet head is out of round by a couple .01 of a mm (.01mm= 0.00039"). "First, calipers are rated for +/- 0.001 inch (0.025 mm) tolerance, and the position of the item being measured in the jaws is critical, as the jaws themselves are not perfectly parallel…………"
As shown in the pic above, the accuracy measuring the test bar is certainly accurate enough for my purposes. Also, notice in this pic that the caliper jaws are marked so the pellet head is always measured at the same position on the jaws so it really doesn't matter if the jaws are perfectly parallel along the length or not. To measure I gently close the caliper jaws on the pellet head just tight enough that the pellet base will slide on my Formica desk top………………..
"I guarantee that the apertures in the Pelletgage and PelletgageR are within 0.0025 mm (0.0001 inch) of the nominal indicated size"
Hummm….so how does this solve the "pellet head ovality issue"? Your sorting is only going to be as accurate as the pellet head ovality itself and I've measured as much as .02mm when measuring at points perpendicular to each other. "far more likely to be simply measurement error or measurement of a different chord. If you get off axis, you may not be measuring the real OD". Yep, CPLs do have "fat heads" but they are very consistent which can be easily proven by the fit in the leade. "While it is true that the Pelletgage would reject an oval pellet based on the diameter of major axis, it's not as significant a drawback as the errors possible when using just two points on the spheroidal object, and that's ignoring the possibility of instrument inaccuracy. Pelletgage gives repeatable results." "I cannot see how anyone discards the simplicity and traceable precision of the Pelletgage"
There are many positive reviews from "holes in a plate" users that verify that your Pellet Gage will sort pellets so they are more consistent than those coming out of a tin so no harm/no foul. Here are a couple thousand supposedly 4.52mm JSB Exacts that I sorted using the "caliper method"………. These supposedly 4.52mm JSB Exacts actually measured from 4.41mm to 4.53mm which is well within the tolerances of my 6" iGaging Absolute Origin digital caliper. Also I found that the "sort by caliper method" was accurate enough that I could detect the "difference in feel" between sorted sizes when loading. This reply was modified 2 months ago by nced. It did take some practice to get a handle on "caliper pressure" but I am able to get consistent readings on my 1" test bar within a "tenth". LOL......certainly accurate enough for my purposes and to know that a pellet head is out of round by a couple .01 of a mm (.01mm= 0.00039"). 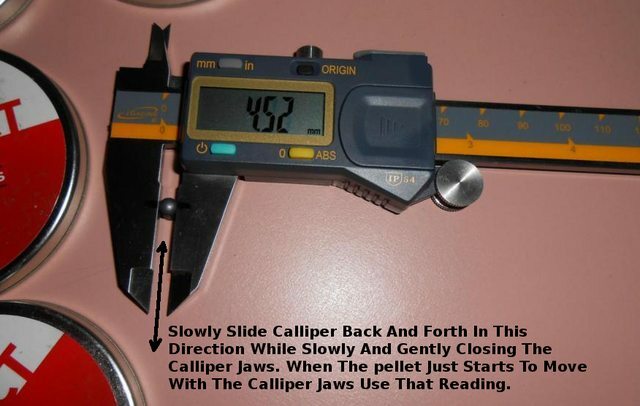 "First, calipers are rated for +/- 0.001 inch (0.025 mm) tolerance, and the position of the item being measured in the jaws is critical, as the jaws themselves are not perfectly parallel............"
Hummm....so how does this solve the "pellet head ovality issue"? Your sorting is only going to be as accurate as the pellet head ovality itself and I've measured as much as .02mm when measuring at points perpendicular to each other.